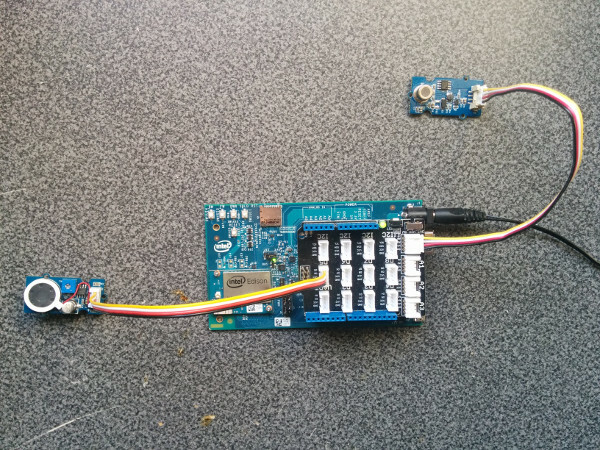 Interface with the Intel® Edison board or Arduino 101* (branded Genuino 101* outside the U.S.) board IO and sensor repository using MRAA and UPM from the Intel® IoT Developer Kit, a complete hardware and software solution to help developers explore the IoT and implement innovative projects. 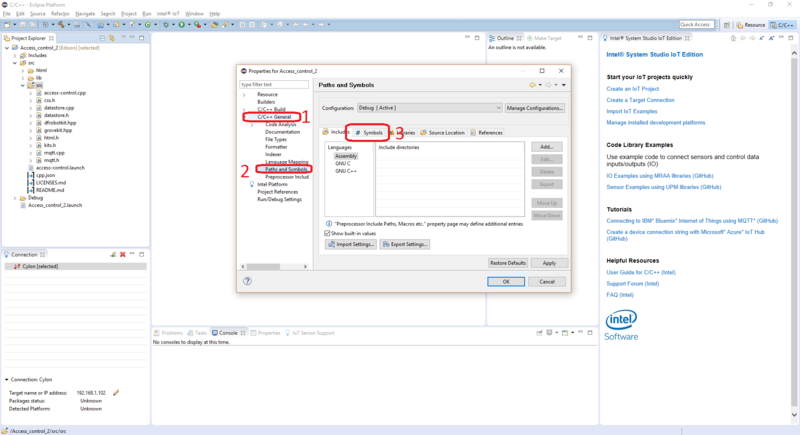 Run these code samples in the Intel® System Studio IoT Edition (Eclipse* IDE for C/C++ and Java* development) for creating applications that interact with sensors and actuators, enabling a quick start for developing software for the Intel® Edison board or the Intel® Galileo board. 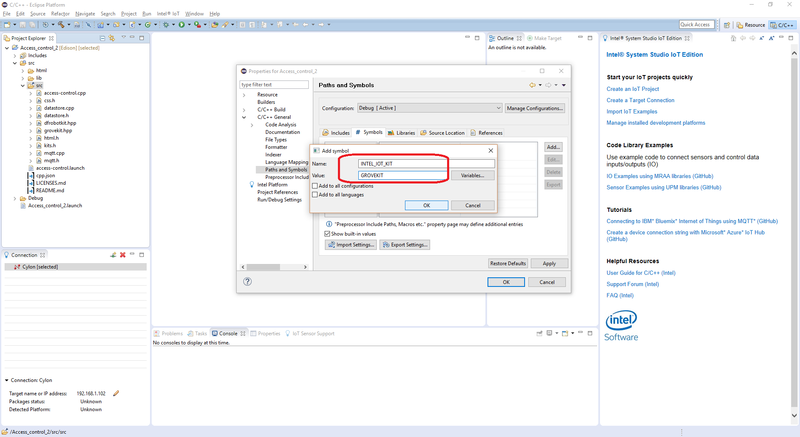 Store air quality data using Azure Redis Cache* from Microsoft*, Redis Store* from IBM Bluemix*, or Elasticache* using Redis* from Amazon Web Services (AWS)*, different cloud services for connecting IoT solutions including data analysis, machine learning, and a variety of productivity tools to simplify the process of connecting your sensors to the cloud and getting your IoT project up and running quickly. continuously monitors the air quality for airborne contaminants. sounds an audible warning when the air quality is unhealthful. stores a record of each time the air quality sensor detects contaminants, using cloud-based data storage. This shop air quality monitor uses the sensor to constantly keep track of the airborne contaminants. If the sensor detects one of several different gases, and the detected level crosses a predefined threshold, the speaker makes awarning sound. Optionally, data can be stored using your own Microsoft Azure*, IBM Bluemix*, AT&T M2X*, AWS*, Predix*, or SAP* account. 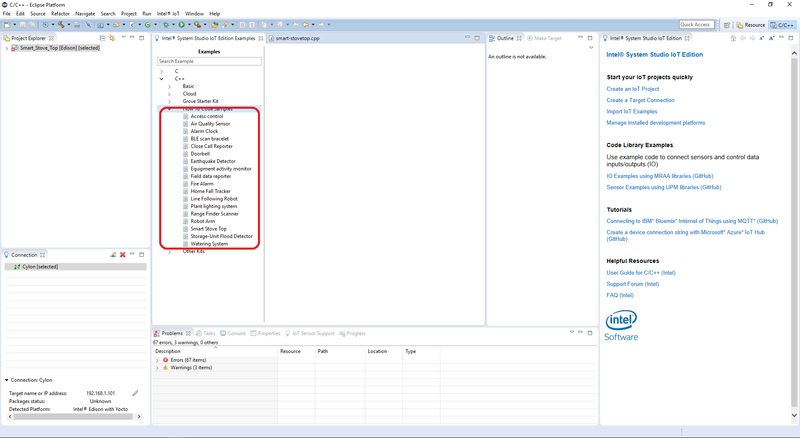 From the main menu, select Intel® IoT > Import IoT Examples. 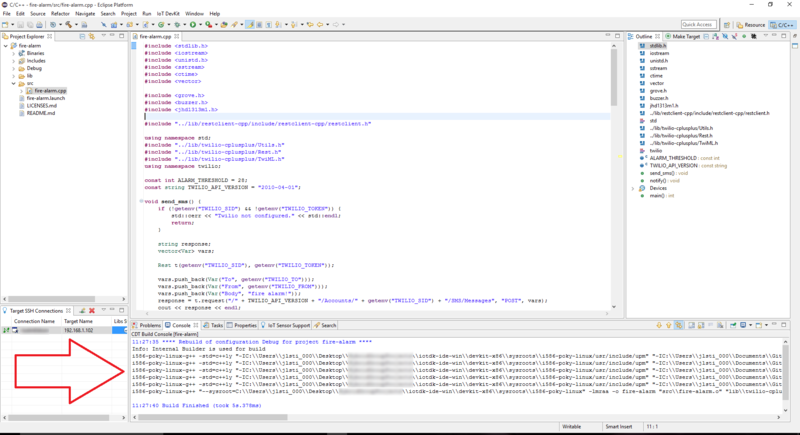 Expand the tree view for C++ > How To Code Samples > Air Quality Sensor and click Import Example. Select your developer board from the selection window then select Next. Select Intel® IoT C/C++ project from the Select a project type window then click Next. Select Yocto from the Selct target OS dropdown menu then click Next. The next tab will ask for connection name and target name. If you do not know these click Search Target. Select your Edison from the dropdown list. Select OK. Your connection name and target name should be filled in. Select Finish. A new window will open for you and you will need to choose a name for your project and click Next. 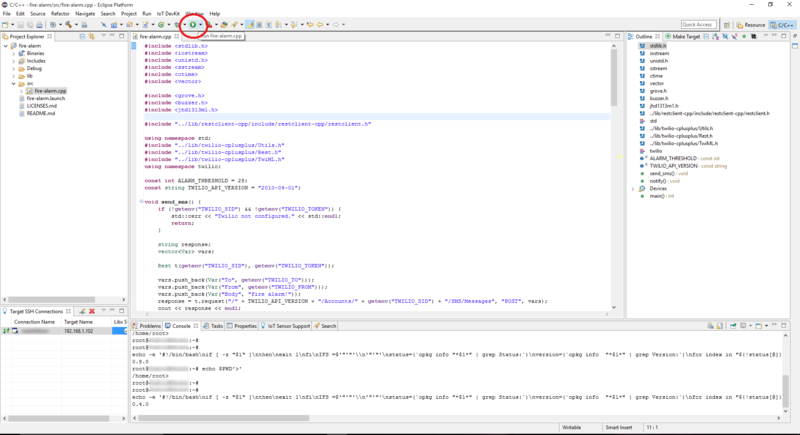 Your project source files will now be available on the on the upper left of your IDE by default. You need to have a Grove* Base Shield V2 connected to an Arduino* compatible breakout board to plug all the Grove devices into the Grove Base Shield V2. Make sure you have the tiny VCC switch on the Grove Base Shield V2 set to 5V. Plug one end of a Grove cable into the Grove TP401 Air Quality Sensor, and connect the other end to the A0 port on the Grove Base Shield V2. Plug one end of a Grove cable into the Grove Speaker, and connect the other end to the D5 port on the Grove Base Shield V2. You need to have a DFRobot* LCD Keypad Shield connected to an Arduino* compatible breakout board to plug all the DFRobot* devices into the DFRobot* LCD Keypad Shield. Plug one end of a DFRobot* cable into the Buzzer, and connect the other end to the A1 port on the DFRobot* LCD Keypad Shield. Plug one end of a DFRobot* cable into the Air Quality Sensor, and connect the other end to the A3 port on the DFRobot* I/O Expansion Shield. This example uses the restclient-cpp library to perform REST calls to the remote data server. The code can be found in the lib directory. The restclient-cpp library requires the libcurl package, which is already installed on the Intel® Edison board by default. 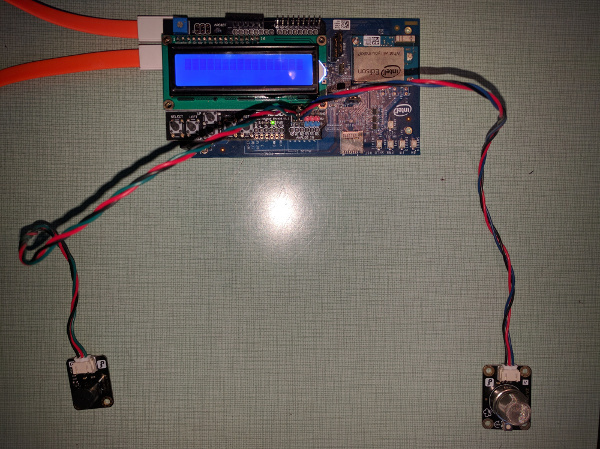 You can run this example using an Intel® IoT Gateway connected to an Arduino 101* (branded Genuino 101* outside the U.S.). The Arduino 101* (branded Genuino 101* outside the U.S.) needs to have the Firmata* firmware installed. If you have IMRAA installed on your gateway, this will be done automatically. Otherwise, install the StandardFirmata or ConfigurableFirmata sketch manually onto your Arduino 101* (branded Genuino 101* outside the U.S.). You can optionally store the data generated by this sample program using cloud-based IoT platforms from Microsoft Azure*, IBM Bluemix*, AT&T M2X*, AWS*, Predix*, or SAP*. Optionally, you can store the data generated by this sample program in a back-end database deployed using Microsoft Azure*, IBM Bluemix*, or AWS* along with Node.js*, and a Redis* data store. 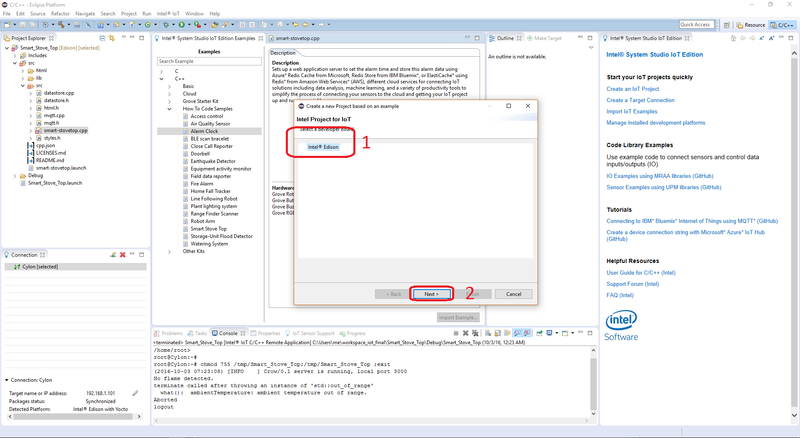 From the main menu, select Project > Properties dialog box is displayed. Expand the section C/C++ General. Click on the Paths and Symbols sub-section, and click on the Symbols tab. 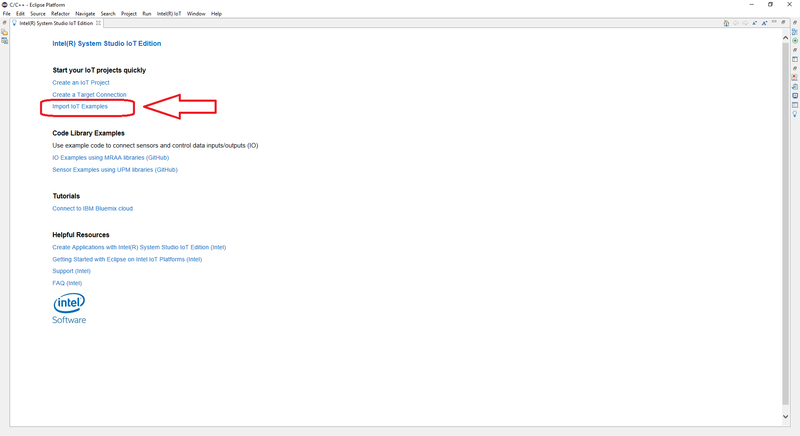 Now click on GNU C++, and click on the Add button. 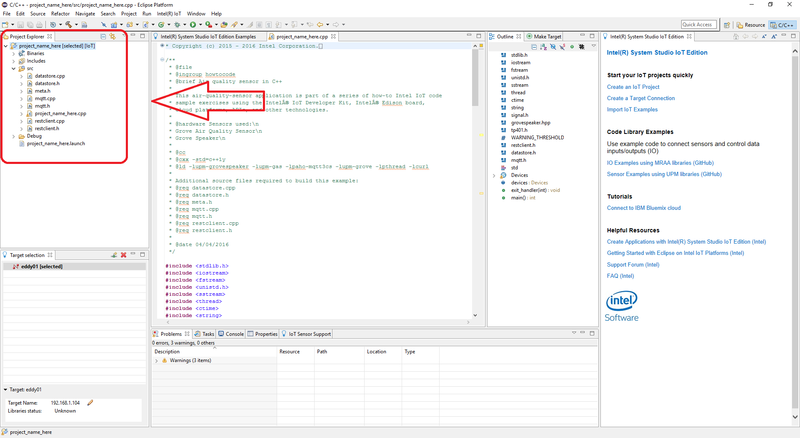 In the Name field, enter "INTEL_IOT_KIT". In the Value field, enter either "GROVEKIT" (this is the default) or "DFROBOTKIT", depending on which hardware kit you wish to use. Your new name symbol and value will now be displayed. Click OK.
Another dialog box will appear asking to rebuild project. Click OK.
On the Target SSH Connections tab, right-click your device and select Connect. 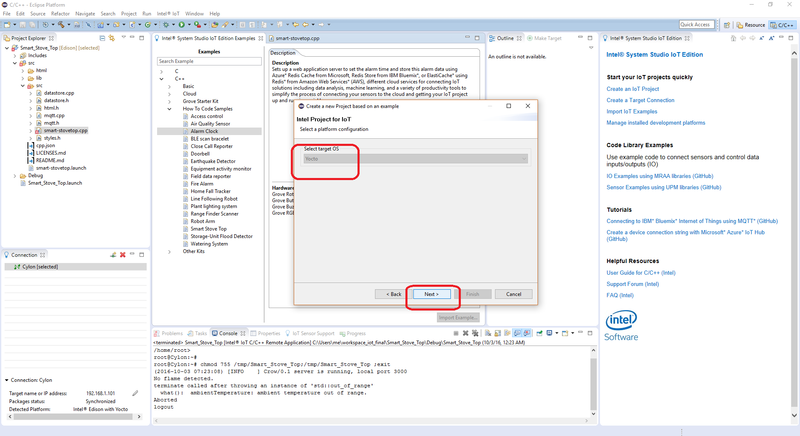 If prompted for the username and password, the username is root and the password is whatever you specified when configuring the Intel® Edison board. 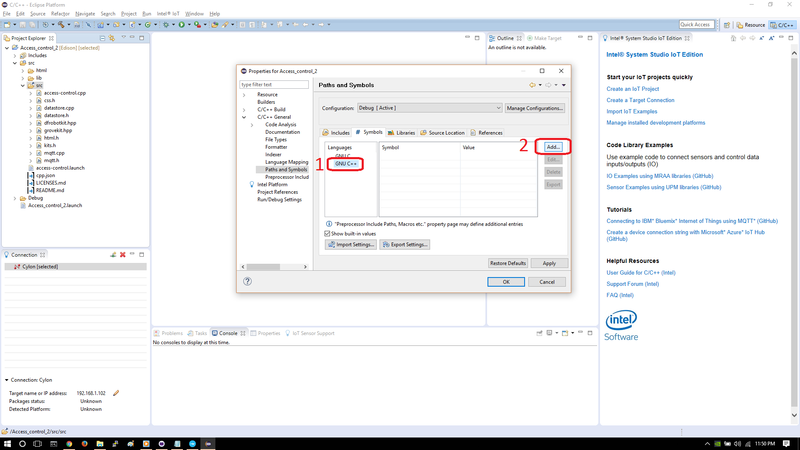 From the Run menu, select Run Configurations. 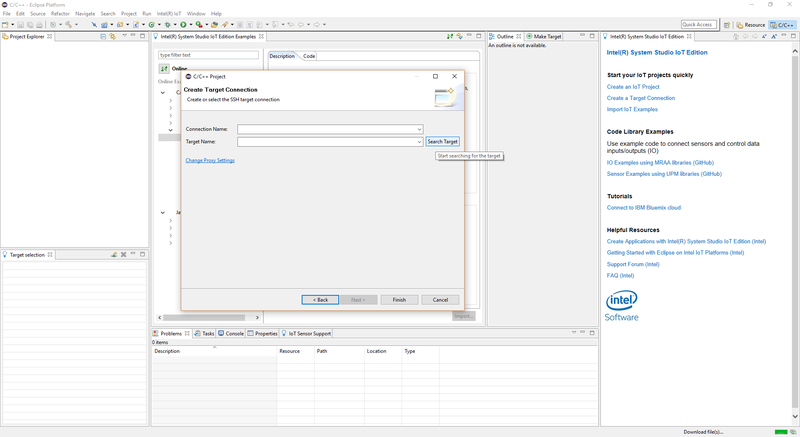 The Run Configurations dialog box is displayed. 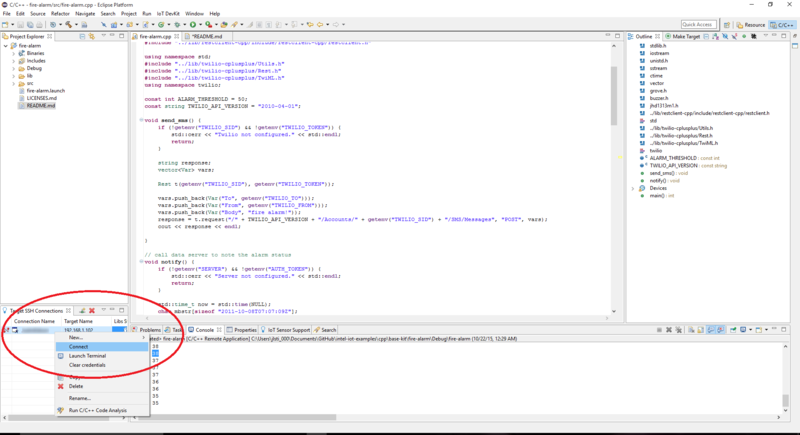 Under C/C++ Remote Application, click doorbell. This displays the information for the application. chmod 755 /tmp/air-quality; export SERVER="http://intel-iot-example-data.azurewebsites.net/logger/air-quality"; export AUTH_TOKEN="Enter Auth Token Here"
Click Apply to save your new environment variables. 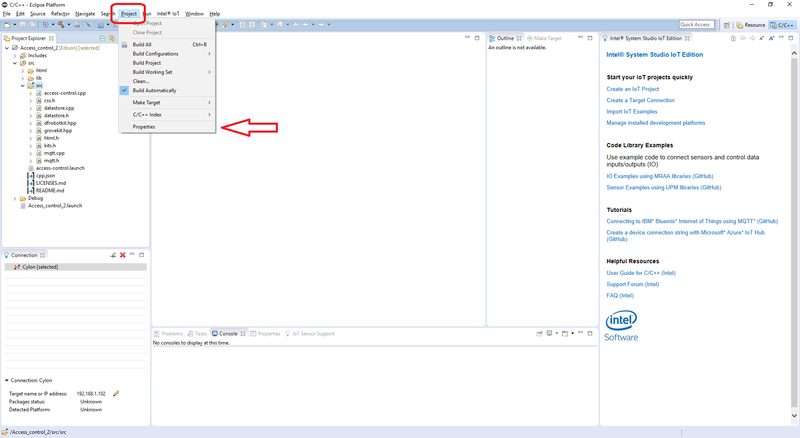 Now, when you run your program using the Run button, it should be able to call your server to save the data right from the Intel® Edison board or Intel® IoT Gateway. 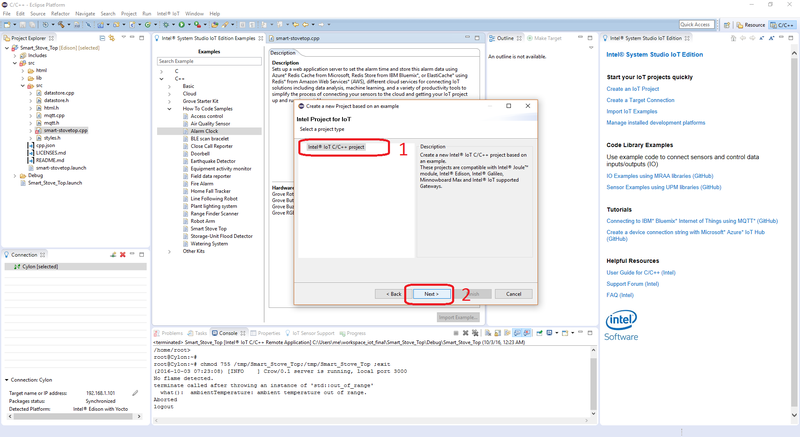 When you're ready to run the example, click Run at the top menu bar in Intel® System Studio. 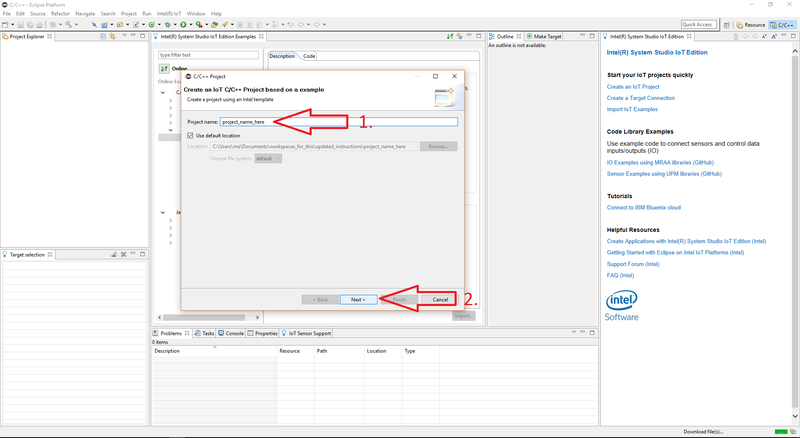 This compiles the program using the Cross G++ Compiler, links it using the Cross G++ Linker, transfers the binary to the Intel® Edison board or Intel® IoT Gateway, and then executes it on the board itself. 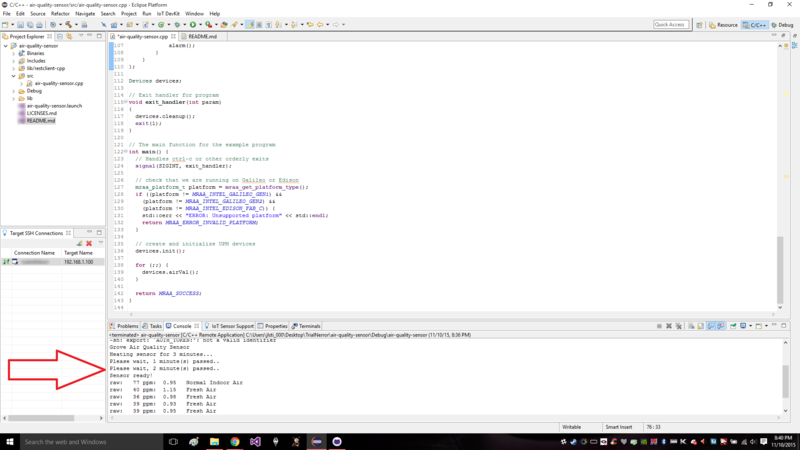 After running the program, you should see output similar to the one in the image below. After running the program you should have output similar to the one in the image below. IMPORTANT NOTICE: This software is sample software. It is not designed or intended for use in any medical, life-saving or life-sustaining systems, transportation systems, nuclear systems, or for any other mission-critical application in which the failure of the system could lead to critical injury or death. The software may not be fully tested and may contain bugs or errors; it may not be intended or suitable for commercial release. No regulatory approvals for the software have been obtained, and therefore software may not be certified for use in certain countries or environments. it will re-directed to missing page..